I started using the Erin Condren Life Planner in April of this year when both my older sister and my mother were sharing pictures of their planners. I fell in love with the beauty but as I used the planner I fell in love with the functionality and how I am a million times for organized. I am actually getting things done! 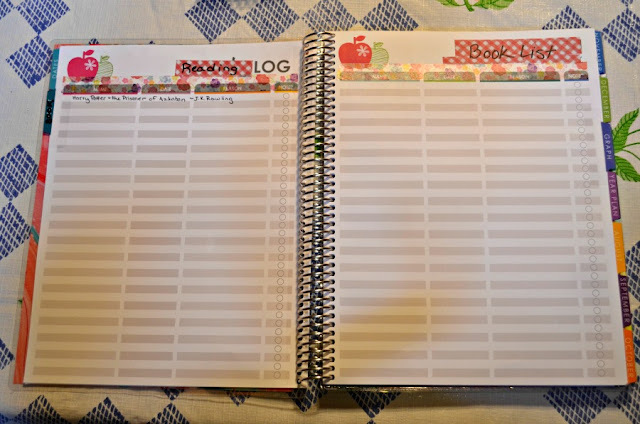 I needed a planner all my life. 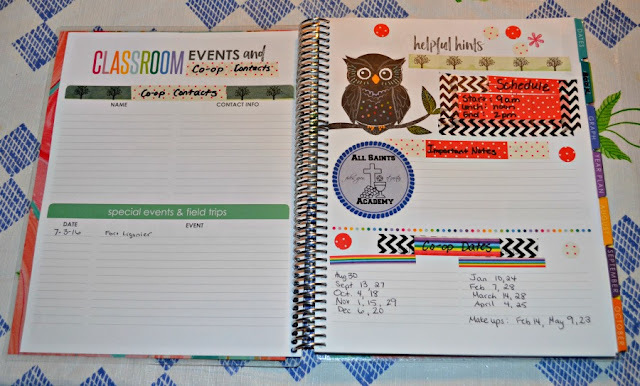 When I bought my Life Planner I received a coupon in the package, and when I got around to starting to plan the 2016-2017 school year I looked into the Erin Condren Teacher Planner. With the coupon and my birthday coming up I decided to go ahead and get it. I am so happy I did! 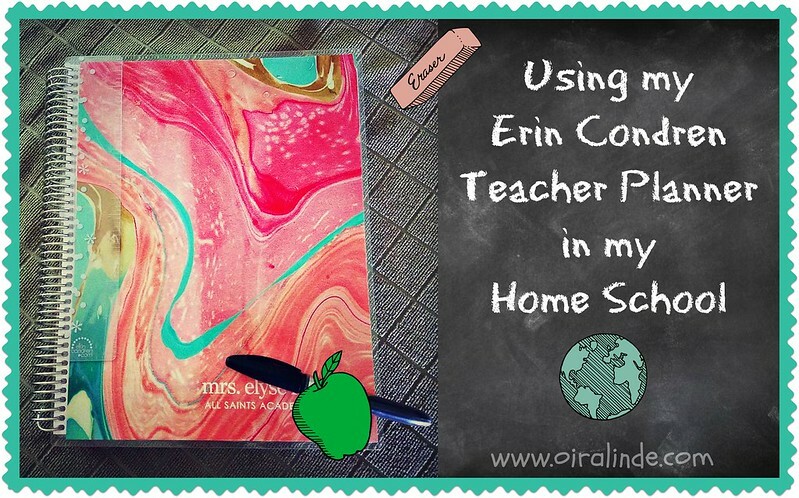 Let me show you how I changed it up to make it work for my homeschooling purposes. I am not receiving any compensation for this post. 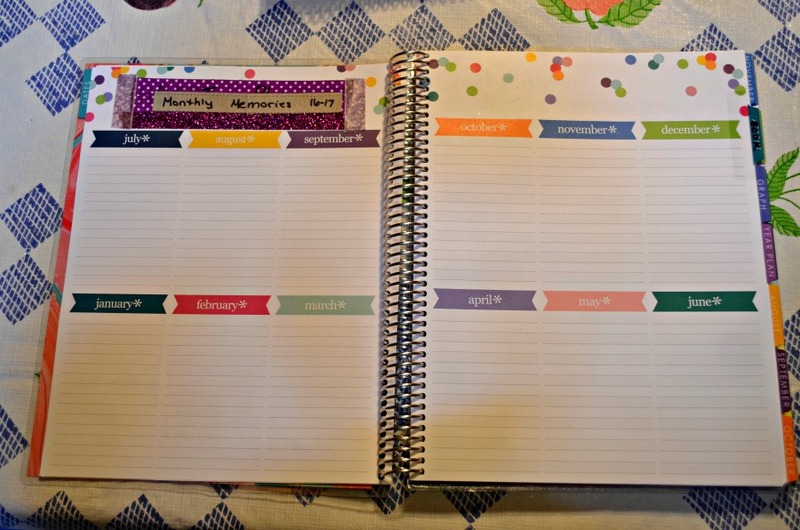 I bought my Erin Condren planners with my own money. I love that the planner is a full 8 1/2 x 11 " planner. There is plenty of room to write in there. For the All About Me page, I printed out my homeschool logo to paste over the schedule. 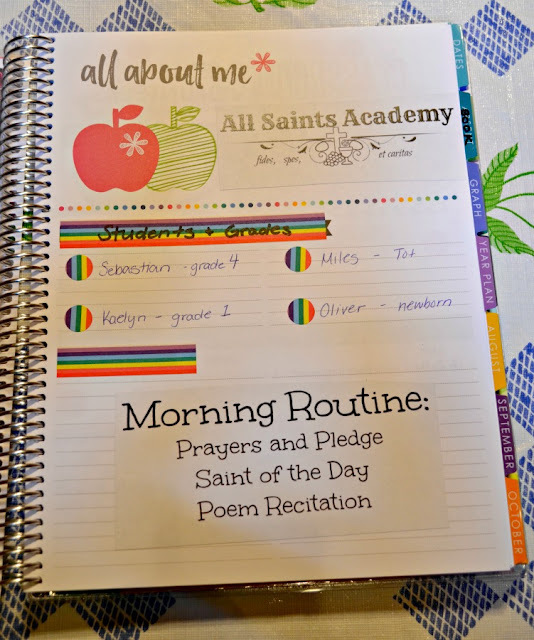 I also don't need access codes or website references, so I wrote in my kids names and grades as well as what our morning routine is. I clearly don't have any classroom volunteers, so I am using that section as a quick references for co-op contacts. I am just writing names, phone numbers, and emails. I am also using the special events and field trips for a list of field trips. We try to take one a month, but with a baby due in September I am thinking we may have less in the fall but more in the spring. I won't ever have a substitute, so I changed that into a basic schedule. We are usually finished with school by lunch time, but 2pm seems like a good cut off time. If they don't finish by then we need to evaluate what is going on that day. I also have an Important Notes section for any things that come up and dates for our co-op instead of helpers and special needs sections. Instead of a birthday spread, I am turning it into memories of the year. As we go through the months, I would like to ask the kids what they remember about the month. What was special and make notes of them as we go. I think this will be a wonder page to look back on at the end of the year. Unfortunately, we have a bad memory to add to July because our dog passed away, but it is still an important memory for our family. September we will have a wonderful memory to add- the birth of a new baby! I am looking forward to using these pages. Instead of an absentee log, I am turning these pages into a book list for my oldest. My daughter isn't reading books quite yet so she won't need to use these pages, but Sebastian may overfill and I'll have to add in some additional pages before the end of the year. He LOVES to read. Here is how my first month looks. I plan on writing in the days we have school. So far we had a field trip on July 3rd as our first day of school. We were going to start school last week, but our dog got very sick and we had to put him down so I decided we would wait until August to start school. It gives us time to grieve and adjust. I made these stickers myself and had a fun time decorating the month. I actually went ahead and numbered all my months in advance. I wasn't sure how much time I would have to play around once another little one came into our lives. 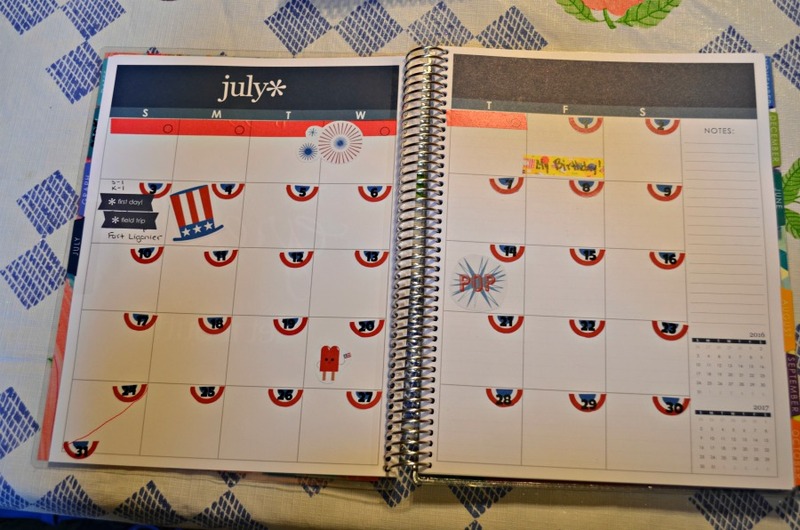 This is our first week in the planner. I used clear labels to add the subjects along the top. I deleted the week names with washi because we don't have set days for school. I would rather just write the dates in when we get to it. Because I have two students, I use two different colored pens for my kids. We typically have four day weeks, so after week 1, the top line is actually used for a supply list instead of a review day. I haven't decided how I am going to use the checklist in the back of the book. There are a few subjects I will be grading like math for both kids as well as Sebastian's writing, but that won't take up much room. I may use it for our memory work or chores. 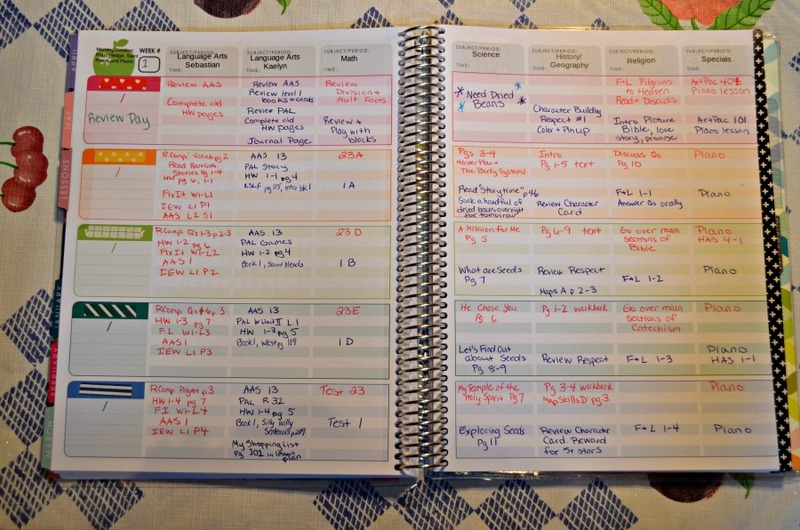 I plan on posting an update on our EC Teacher planner about midway through the year to show how we are still using it as well as any changes to the pages. You can get $10 off your first order by using my referral link (I will also get $10 off).